Damnation is an ekphrasis, confession, and obsessive response inspired by the films of Béla Tarr, and the novels and screenplays of Tarr’s collaborator Lászlo Krasznahorkai. It’s a strange project, one from which I may never recover, and one that has locked me into a strange stasis of being. Among its themes: disintegration, time, eternity, the apocalypse, conspiracy, darkness, the filmic long take. The story of a strange book that arrives in a strange town and the fears of its inhabitants. Wait, that doesn’t sound like it has anything to do with Asian-American issues? Can that be? How can that be? You’re absolutely right. Should it? I’m overdoing my tone on purpose, and you recently told me that you are asked this question. At &NOW Boulder, keynote Percival Everett indicated that he once met a NY editor who rejected one of his mss because it had nothing to do with black people. To what extent do you feel the identity issue is at the core of expectations about your work, and how do you, if you do, attempt to “counter” these expectations (limitations?) in a text? There are strange expectations that come with being a writer with certain labels: “female,” “experimental,” “Asian-American,” “Korean-American,” etc. I’ve often been solicited for work by editors of journals that focus on Asian-American writers, and when I send them my writing, they claim that “it’s not what they were looking for.” Which is sort of BS right, considering that I’m sending them exactly the type of work that I have always been doing, but they’re wanting a certain kind of work based on who they think I am, ie. Asian-American, ie. a writer writing about Asian-American-ness, ie. 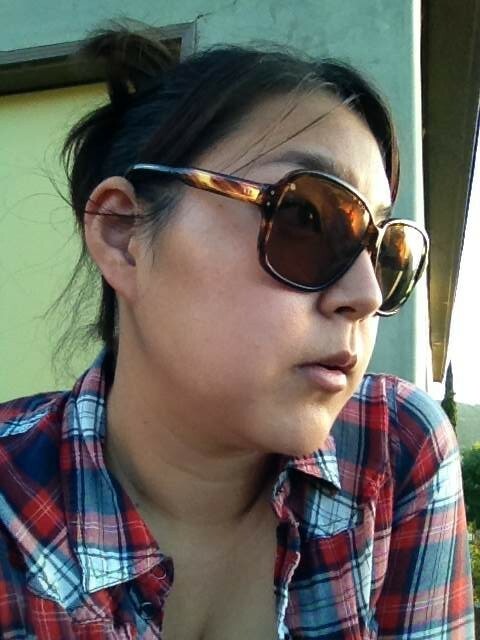 a writer writing about Asian-American-ness according to a certain set of rules and guidelines. Or, it’s that that I’m not these things. Of course I am. But there are certain standards and certain narratives that are expected out of certain identity categories. Having certain labels associated with one’s identity sets certain expectations. “Experimental” and “woman” are two other labels that get added to “writer,” and those set expectations too. So it’s also been interesting with Damnation, that the work isn’t “feminist” or “experimental” in the same way that my past works were perceived to be, and when people’s expectations aren’t met, they might just dismiss rather than engage. Sorry, could you repeat that? I wasn’t really listening. Wait, I read this over e-mail. Never mind. Are these really “strange” expectations, or perhaps just manifestations of authorial essentialism that decades of poststructuralism has done little to alter in any fundamental way. Isn’t the “death of the author” a bunch of nonsense in a Duchampian sense that actually recuperates authorship? AND, if my above question has any significance, wouldn’t there be no real benefit to making texts that seem innovative as opposed to more conventional realist models, in that neither would “speak” without our assumptions of the writer? Well, right, our assumptions of the writer are inseparable from the reading of the text, meaning we “read” writers as much as we “read” books. But also, I don’t think writers lean towards innovation versus conventional realism because there are “benefits” per se. There certainly aren’t concrete benefits like money and health insurance, but because writers feel that certain stories need to be told in certain ways. AND, then, isn’t anything you write really a book about Asian American issues because how can the book separate from what people think they know of the author? Well right, aren’t all books written by people? (Well, not ALL. You’re right, there are the machines. But you get my drift.) So then in that mode any book I write is simultaneously about all aspects of my identity, which aren’t easily categorizable (at least I attempt to hold on to this belief), and every interaction, relationship, conversation I’ve ever had with any other human being is also part of me somehow, so in a way, parts of all those people, whatever “identity” they identify with, are also part of me? Maybe? Am I going too far? But anyways, it also has to do with which parts of a person’s identity are easily visible to the public. And in a way, though I write fiction, all of it is somehow about me in some way, filtered through my lens, etc. How much does the visibility of your authorial persona play into the reception of your texts? If I take your point above, it’s that these are inseparable on some level, and that you recognize that the linkages between the two are to some extent curated. Here, and particular in your other career as a web designer, I wonder how much you think about the curation of persona in relation to your writing? Probably this is a better question aimed at my readers, as I can’t know exactly how much knowing about me has to do with how they read my texts. Probably with some people, a lot, and probably with others, very little. I do think a little bit about curation of my persona online though. Partially, my work as a web designer lets me know how interconnected the internet really is, how much about us there really is, etc. But anyways, maybe I can do a slight role reversal and ask YOU (as a reader) if my authorial personal plays into your reception of my texts? Only insomuch as I read your author function as an innovative, west coast writer whose work, for me, seems to some degree aesthetically conversant with other southern California things I know about, while also interfacing nicely with the larger indie scene. I also know that those words “innovative” and “indie” can be fraught, and limiting, and not at all accurate. Beyond this, though, and this is admittedly extremely abstract in what it means for my reading your work, no. I don’t read your works as Asian American, although I certainly enjoyed (and have taught) Daughter. Put another way, is the expectation of certain editor/readers/etc. that your work conform to Asian American tropes a function of the information available about you online? Do you ever consider the assumptions that might be made about you before tweeting, etc? I ask because I sometimes experience a version of this in terms of my Jewishness. I don’t edit, necessarily, but I experience my digital persona in broader terms, against my own sense of complex ethnic and cultural identity. Well, one thing is that this has actually been happening more lately, as my name becomes more visible, as editors or other writers “hear about me,” or at least hear about my name, or hear about my identity, or you can easily google me and find my photo pretty readily, as editors start to want to feel more “inclusive” and “diverse,” etc. But there’s a pressure to be dealing with certain identity themes and issues more head on, more directly, and obviously. But in terms of what’s out there, I have a pretty good idea. A version of the same bio I’ve been using is usually out there in some form, one of a few photos of me that get used readily, etc. I never label myself as an Asian-American writer. But it’s not even just race that becomes a constricting label. It’s also aesthetic, style, gender, etc. I’ve been told that Damnation is more “conventional” than my previous work. I’ve also been told that it reads at times as “masculine.” I mean, what do these words even mean? Is it productive to look at style or aesthetic and consequently presume identity? We are all working against the expectations set by our previous work, I suppose—which is why I try to do very different things with my projects. DRAIN is sci-fi(ish), while [SIC] is conceptual, while my HuffPost essays are sometimes darned heartwarming, and yet I feel enfranchised, almost furiously obligated, to work differently. I change my process to change my style. The word “masculine” is meaningless when describing a text, except as that term intersects, or doesn’t, with a reader’s pre-conceived understanding of its connotations. I read this understanding in your work, but let me ask how explicitly you would chafe, if at all, from “conventional” success. Do you want to write something that might be at home at Random House? In his new book on Béla Tarr, Jacques Ranciere writes the following: “A style as we know after Flaubert, is not the embellishment of a discourse, but a manner of seeing things: an “absolute” manner, says the novelist, a manner of absolutizing the act of seeing and the transcription of perception, against the narrative tradition that rushes on to the effect that follows from a cause. For the writer, however, “to see” is an ambiguous word. It is necessary “to make the scene visible,” says the novelist. But what he writes is not what he sees, and it is this very gap brings literature into being.” This resonates with me in the idea that style, or aesthetic, isn’t about discourse. In many ways it can be, I don’t mean to discount the history of the literary avant-garde, but style also has much more to do with the way a person simply sees things, how they see the world. What one sees is inextricably bound up with how on sees. And during the process of writing Damnation, I saw things very differently. My relationship with the world, with writing, with cinema, with myself all changed. I’m still reconciling this now. So in response to your question if I would ever want to write something that might be at home with Random House. Why not? I try not to write for a certain audience. The way I write has much more to do with my own relationship with language and narrative than with telling someone a good story. But I don’t dismiss this possibility. Will I likely write something that Random House would pick up? Probably not. But if I did, would I make a political decision not to go with a publisher like that? Of course not, that seems idiotic to me. Related to this: Is there anything essential to be a small-press/indie/innovative writer, or are those also just words (the flip side of “conventional” and “masculine”)? Something I’ve been thinking about is, what the point of these terms anyways, especially terms like “innovative” and “experimental” vs. “conventional” and “traditional” and “realistic.” There’s a history and context here, of course, but also these terms are less and less productive. To me, it seems that a term like “experimental” or “innovative” seems to want to be an empowering term, to legitimize types of writing and ways of writing, to lend them authority, especially politically. But at the same, these terms are marginalizing in themselves, that in seeking to categorize something to lend it some sort of power and authority in a certain context, it also allows itself to be categorized in that manner, allows itself to be marginalized as an other category and becomes complacent in this way. This is the push and pull of labels, right? And it’s a political stance. Because of what “experimental” and “indie” have come to stand for in a certain literary context, a term like “conventional” becomes an insult. Terms become polarized. Like “liberal” and “conservative.” But the more terms are polarized in a semantic and symbolic sense, the less they start to make sense in real life. Of course, and the empowerment of the outré terms often leads to elaborately comical attempts by those inhabiting those spaces to argue for 1) a certain aesthetics purity or 2) a reach well beyond the real (but obscured by dogma) limitations of distribution. I cringe, and laugh, when I read about the next small indie book radically reinventing literature, or whatever, and yet such discourse is only going Lady MacBeth because there is a kernel of legitimate resistance that might be located within that space. And yet, the best way to un-subvert the subversive is to shout it from the rooftops. There, everything becomes either earnest, or a parody of earnestness. Given all if this, Janice, what’s next? What follows Damnation? 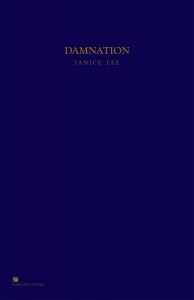 JANICE LEE is the author of KEROTAKIS (Dog Horn Press, 2010), Daughter (Jaded Ibis, 2011), and Damnation (Penny-Ante Editions, 2013), a book-length meditation on the films of Béla Tarr, as well as the chapbooks: Red Trees, Fried Chicken Dinner, The Other Worlds, and The Transparent As Witness (a collaboration with Will Alexander). She currently lives in Los Angeles where she is Co-Editor of [out of nothing], Reviews Editor at HTMLGIANT, Editor of the new #RECURRENT Novel Series for Jaded Ibis Press, and Founder/CEO of POTG Design. 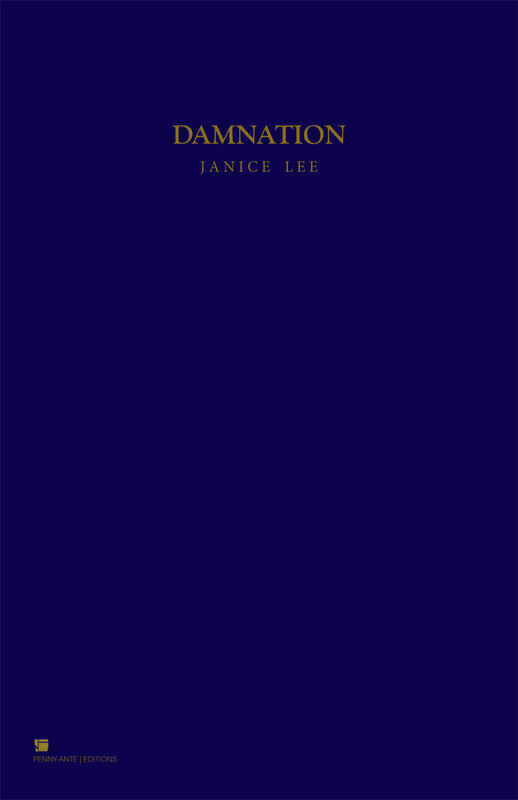 She currently teaches at CalArts and can be found online at http://janicel.com.